If you’re a keen gardener you’ll no doubt appreciate that there’s rarely a time when you can kick back and forget about your garden. Even as summer draws to a close and it feels like there’s a chance to relax, it’s already time to be preparing next year’s garden. Spring bulbs need to be planted from September onwards (although Tulip planting should wait until mid October or November), and that means it’s now time to decide what you want to plant and to get your bulb orders under way. 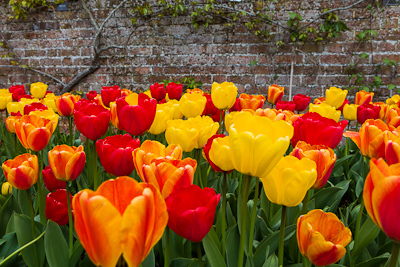 If you have a dedicated cutting garden or just want to add to your mixed borders, then there are a number of really good spring bulbs which will ensure you have a constant supply of cut flowers throughout the season. Tulips are the mainstay of the spring cutting garden – and for good reason. 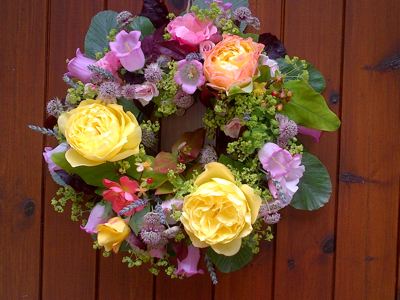 They offer an enormous variety of colour, and provide cut flowers in April and May. Tulips are divided into ‘groups’ which flower at different times, and which come with different flower shapes and sizes. Generally, the best groups for cutting are Triumph, Viridiflora (multi-coloured), Lily flowering, Parrot flowering and Double Early Tulips. If you are looking for elegance, I would recommend trying creams and whites (such as ‘Spring Green and ‘White Triumphator’) and the beautiful dark purple of ‘Queen of Night’. And Lily flowered Tulips are a particularly lovely shape. For intense reds and oranges, go for ‘Jan Reus’, ‘Havran’ or ‘Abu Hassan’. In the purple and pink range, try ‘Recreado’ or ‘Shirley’. One thing to bear in mind when planting Tulips – they need good drainage, so if you garden on heavy soil, do add grit below the bulbs. Daffs (or ‘Narcissi’ to be technical) are also invaluable as cut flowers as they provide blooms right through from February to May. 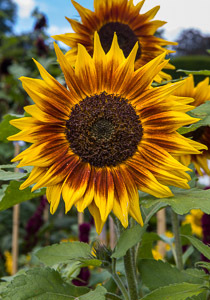 They range in height from about 20cm up to 45cm, and colour-wise from pure white through to golden yellow. 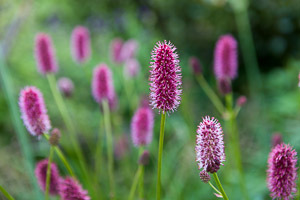 If you are adding them to a mixed border, or aiming to naturalize them in grass, then make sure you plant them in groups and think carefully about planting different varieties which will extend the season of interest in your garden. There’s little point in planting dwarf Narcissi where they won’t be seen, or buying bulbs especially for scent unless you are cutting the flowers for the house or positioning them where you can appreciate their fragrance. 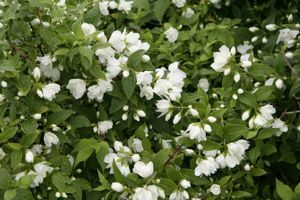 If you are looking for scent, go for a variety such as the lovely white ‘Thalia’ which flowers in March and April. If you prefer smaller varieties, then ‘Tete a Tete’ and ‘February Gold’ are perfect. One of my favourites (as I’m not too keen on the big yellow varieties) is the ‘Pheasant Eye’ Narcissus. 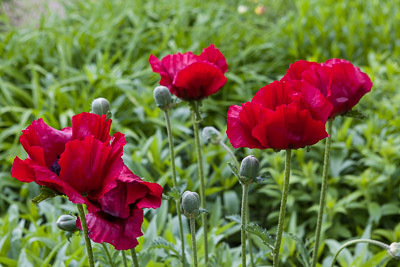 It flowers quite late and is a lovely understated plant which will brighten up any border in May. Hyacinths are invaluable to bring scent in to the house. I’m personally keener on the multiflora varieties of Hyacinth which have (to my eye) a more natural look than the varieties which are more generally available. I think that’s down to the fact that their flower heads are less dense – though still highly scented. Hyacinthus mulitflora ‘Anastasia’ is a particularly attractive blue variety. For a bit of drama, try growing Fritillaria imperialis (the Crown Imperial). 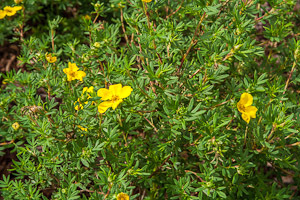 With yellow or red flowers in April, growing to a height of about 3 foot, they look fantastic in a tall vase. In the garden they are also very attractive to bees. The great thing about planting spring flowering bulbs such as the ones I’ve mentioned is that it needn’t cost the earth, and can be done on any scale – even if it’s just in a few pots. The key is to experiment and see what works for you. And if you’re interested in creating a cutting garden for yourself, then please get in touch.